Roy Lichtenstein is one of the originators of the Pop Art movement, famed for paintings that take kitsch and transform it into culture. Lichtenstein was born in New York City in 1923. Growing up, he took art classes at the Art Student League where he created realist paintings. Lichtenstein continued his study of art at Ohio State University but, with the advent of World War II, he enlisted in the army in 1943. Lichtenstein returned to Ohio State after the war to finish his master’s degree in studio art. 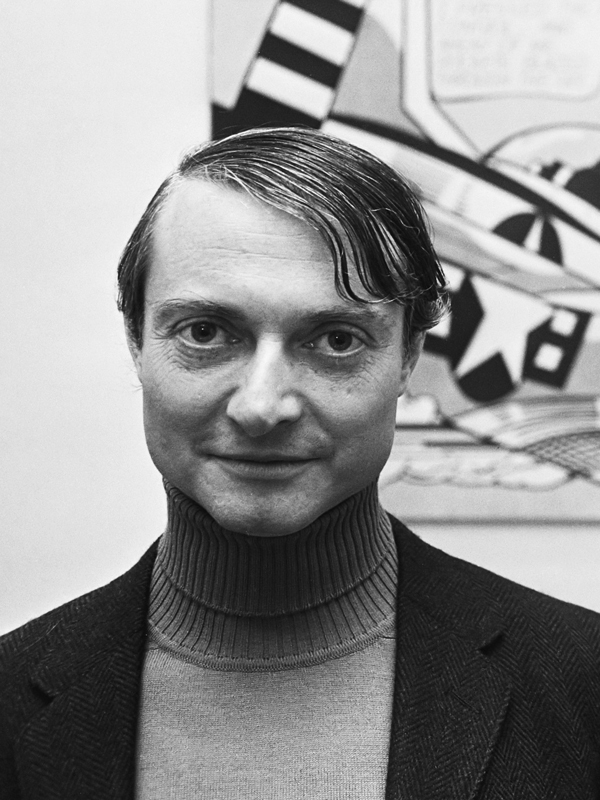 While Lichtenstein was teaching art at Rutgers University, he became close with fellow artist Allen Krapow, who introduced him to Claes Oldenburg. It was during the 1960s that Lichtenstein began experimenting with what would become his signature style of taking images from comic books and newspapers and reproducing them on a large scale, calling attention to the flatness of the imagery with his Ben-Day technique of painting dots. In 1962, Lichtenstein got his first break with a one-man show at the Leo Castelli Gallery, which sold out before it opened. Later in his career, Lichtenstein began to cleverly re-appropriate the work of fellow modern masters like Warhol, Picasso, and Mondrian, either by overtly miming the imagery or by placing these works of art into his Interiors series of paintings. The public alternatively lauded and reviled Lichtenstein for his quiet commitment to painting popular culture, and was often met with mixed feeling; in 1964 Life magazine published an article about him entitled “Is He the Worst Artist in America?” Regardless, Lichtenstein’s place in the canon of modern art is firmly established, and his works are found in major museums across the world. Lichtenstein passed away in 1997.